The spectral class of a star is a designated class of a star describing the ionization of its chromosphere, what atomic excitations are most prominent in the light, giving an objective measure of the temperature in this chromosphere. Class O stars are very hot and very luminous, being bluish in color; in fact, most of their output is in the ultraviolet range. These are the rarest of all main sequence stars. About 1 in 3,000,000 of the main sequence stars in the solar neighborhood are Class O stars. Some of the most massive stars lie within this spectral class. Class B stars are extremely luminous and blue. As O and B stars are so powerful, they only live for a very short time, and thus they do not stray far from the area in which they were formed. A Class A is a light blue star that is made up of strong hydrogen and some ionized metals. The temperature ranges from 7,500 to 10,000 degress K.
A Class F star is white and is made up of hydrogen and ionized metals. Also in the star there is calcium and iron. The temperature in this type of star is between 6,000 and 7,500 K.
A G-class (or G-type) star is a stellar classification for stars composed of both neutral and ionized atoms of metallic substances, including ionized calcium, emitting in the neighborhood of 5,000 to 6,000 Kelvin, generally referred to as being yellow in color. G-type stars in the main sequence tend to be median in terms of absolute magnitude, and in the "cooler" half of the stellar classification system. Yellow G-type stars can range in size from yellow giants to the more diminutive yellow dwarf. A K class (also K type or orange star) is a type of star that is made up of neutral metals. The temperature is around 3,500 through 5,000 Kelvin. Some K stars are giants and supergiants, such as Arcturus, while orange dwarfs, like Alpha Centauri B, are main sequence stars. Class M is by far the most common class. About 76% of the main sequence stars in the solar neighborhood are Class M stars. Although most Class M stars are red dwarfs, the class also hosts most giants and some supergiants such as Antares and Betelgeuse, as well as Mira variables. A protostar is a star in the very earliest stage of development, when interstellar gas is still undergoing gravitational collapse, and nuclear fusion at the core has just begun. The Argolis Cluster is an example of a protostar cluster. Collapsing protostars sometimes emit E-band bursts and are often marked by high levels of magnetascopic interference, which impair sensor function. In theory, a type-6 protostar could be used to generate a wormhole. A flare star is a type of star which regularly experiences brief, random outbursts of solar flares over its surface disrupting energy patterns in its system and sometimes endangering lifeforms. The rare hypergiant star is one which shares similar characteristics with a supergiant star, but is 100 times more massive than Sol. The theoretical lifespan of a hypergiant is one to two million years. Supposedly, like its supergiant companions, a hypergiant star will go supernova when it exhausts its supply of fuel and gravity crushes the inert remains. The Enterprise NX-01 was the first Earth ship to research a red hypergiant at close range in 2152; it was nearly a billion kilometers in circumference and was not expected to go supernova for another one hundred or two hundred years. A neutron star is a type of remnant that can result from the gravitational collapse of a massive star during a Type II, Type Ib or Type Ic supernova event. Such stars are composed almost entirely of neutrons, which are subatomic particles without electrical charge and a slightly larger mass than protons. Neutron stars are very hot and are supported against further collapse because of the Pauli exclusion principle. This principle states that no two neutrons (or any other fermionic particle) can occupy the same place and quantum state simultaneously. Some neutron stars, called pulsars, emit beams of electromagnetic radiation from their poles. A red dwarf is a small, cool, very faint, main sequence star with a surface temperature under about 4,000 K. Red dwarves are the most common type of star. Proxima Centauri and 40 Eridani C are examples of red dwarf stars. A red giant is a very large, relatively cool star, formed when a main sequence star runs out of hydrogen and begins fusing helium. Some red giants are considered B class stars. Supergiants are among the most massive stars. Supergiants can have masses from 10 to 70 solar masses and brightness from 30,000 up to hundreds of thousands times the solar luminosity. They vary greatly in radii, usually from 30 to 500, or even in excess of 1,000 solar radii. The Stefan-Boltzmann law dictates that the relatively cool surfaces of red supergiants radiate much less energy per unit area than those of blue supergiants; thus, for a given luminosity red supergiants are larger than their blue counterparts. 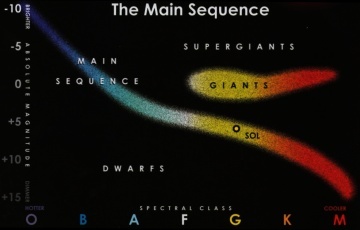 Supergiants occur in every spectral class from young blue class O supergiants stars to highly evolved red class M supergiants. Rigel, the brightest star in the constellation Orion is a typical blue-white supergiant, whereas Betelgeuse and Antares are red supergiants. A T-Tauri type star is one in the earliest phase of its lifespan. The type is named for the first discovered star of this type, seen from Earth as part of the Taurus constellation. Small, extremely unstable wormholes are a phenomenon sometimes encountered in T-Tauri systems - in the century between 2267 and 2367, thirty-nine had been mapped. A white dwarf is a star formed when a red giant runs out of helium fuel after losing most of its mass into space. White dwarfs are the only natural source of vertion particles. In 2370, a network emergent circuit nodes aboard the Enterprise-D collected vertions from the white dwarf Tambor Beta-6 to sustain their growth, but the supply from a single star proved insufficient. A yellow dwarf is a classification of star which is undergoing hydrogen-helium conversion. Sol is a well-known yellow dwarf star. Such a star has about 0.8 to 1.2 solar masses and a surface temperature of between 5,300 and 6,000 K.